THE WRITING BUDDHA - Opinions | Books | Movies: Winning Like Sourav: Think & Succeed Like Ganguly by Abhirup Bhattacharya (Book Review: 4*/5) !!! 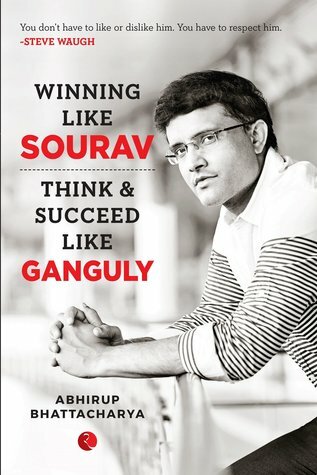 Winning Like Sourav: Think & Succeed Like Ganguly by Abhirup Bhattacharya (Book Review: 4*/5) !!! The one thing I like about any publishing company is its commitment towards innovating a concept and then holding it for a long time. It needs a strong temperament to keep a concept alive and transform it into a phenomena. Rupa Publication is doing the same with the short books it keep releasing almost every month based on a Sports Superstar and help us understand their traits and qualities on adopting which we can also excel in our respective fields. The latest that I read in this collection is the book based on none other than Sourav Ganguly named “Winning Like Sourav: Think & Succeed Like Ganguly” written by Abhirup Bhattacharya who also wrote the book on Virat Kohli in the same series. Sourav Ganguly has been one of the most appreciated Cricketers in India and across the world irrespective of the numerous controversies he has been involved in. His determination and never-give-up attitude has made him reach the zenith that he is at. He still does not sit quietly irrespective of retiring a long while ago and is completely engrossed in commentary, one of the Cricket Boards, hosts two reality shows in Bengali language etc. Sourav Ganguly is known for his captaincy tactics which transformed the Team India such that it started winning overseas matches where they couldn’t stand still in the past. Abhirup Bhattacharya has very simply explained how he has been able to contribute not only as a batsman or Captain of Team India, but as an individual from whom one can take management and life lessons. The book consists of different chapters which are basically the qualities that Ganguly possesses such as Making of Brand Sourav, leadership, mental strength, quick learning, risk taking abilities, grooming future leaders, power of his aggression etc. The best part is how author has described about his sacrificial attitude where he always gave away his power just to make sure that another youngster in the team gets opportunity. The way his leadership skills are discussed gives beautiful insight. All the things that Ganguly did even with aggression is conveyed with a sight that you and me had never acknowledged and always saw it with negative attitude. Overall, the book is a good motivation. I give it 4* out of 5 for its genre.